Since January,I've been trying to do one small project every week or so, either for myself, for the home, or for my family. It's nothing big. Arranging my dressing drawer. Arranging a pretty centerpiece for the living room table. Writing one blog post. Nothing big or overwhelming that might scare me into not doing it at all, or actually tackling it then not finish it because I got swamped. This week project is getting rid of my old books. I'm an avid reader and boast a huge collection of books. Some books, though, I decided that after reading them once, I don't care to keep them in my treasure chest. These books I collect, I put them into a small A4 paper cardboard box, and once the box is full, I sell them to a used book store. I also sold about a dozen or so to friends via my facebook. They are happy about it because they can buy cheaper than at the bookstores.That way when I'm looking at my book collection, I only see the ones that I know I'll enjoy reading over and over again, and not just a bunch of random books which reminded me of "wrong buys". At the same time, I'm providing extra space to buy new books, AND make some pocket money. Not much, but better than those books just sitting there collecting dust. I found that finishing small projects like that give me satisfaction and a sense of achievement. It makes me feel good and productive, and encourages me to do more projects and get even more organized. So yeah, I believe in taking baby steps. Start small. And before you know it, by the end of the year, you would have finished 52 mini projects. That doesn't sound so small, isn't it? 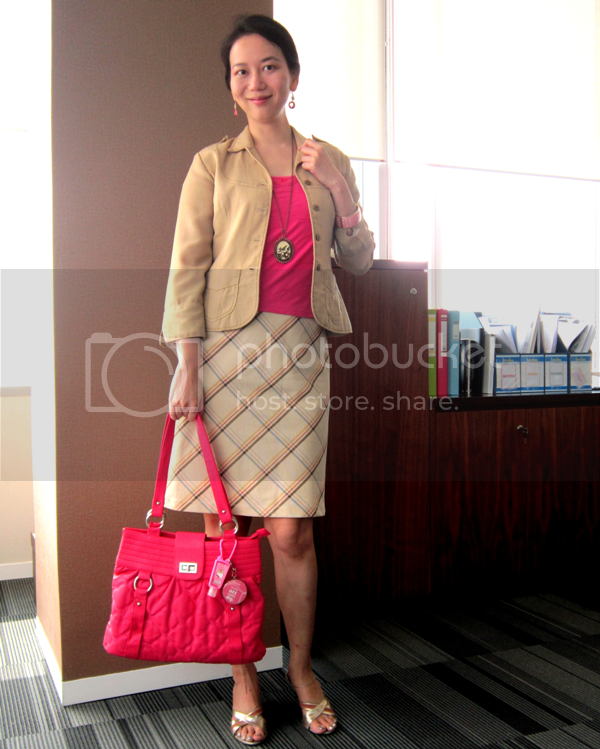 I'm wearing fuschia pink and camel brown today. 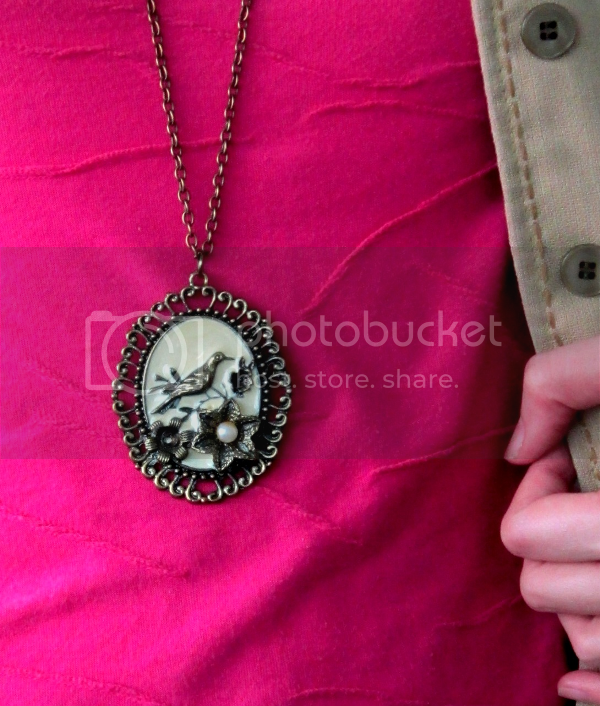 I love the bird detailing going on this medalion style necklace. It's so dainty and cute. 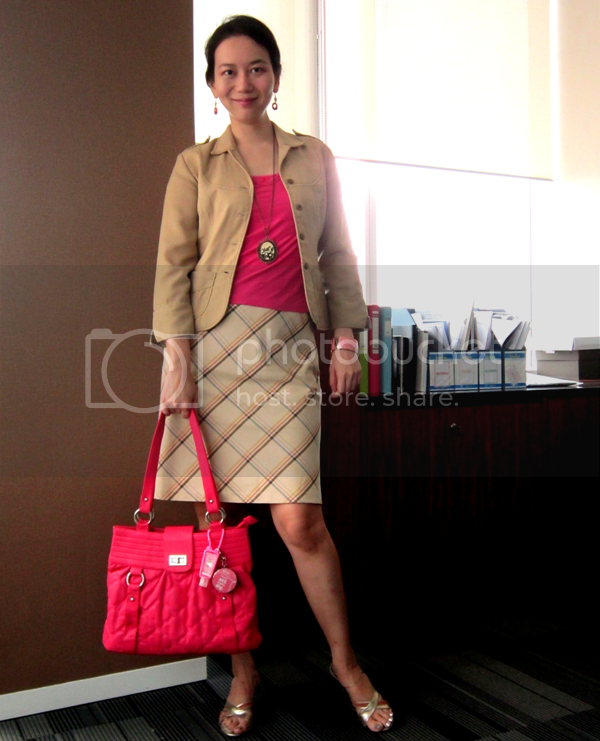 I love the print of that skirt and the combination or camel and fuschia looks great! That jewelry is lovely - especially the bird necklace. great outfit, and it seems pretty warm where you are (with open toe shoes). I love that with some boots this could work where I am (snowy). Perfect plan to ultimate organization~ inspiring! Good idea - a little bit every day or week is the best way to achieve almost anything! Love the retro cute styling of your necklace. Very sweet. LeeAnne...I loved your outfit. The necklace is really pretty. But even more I loved the small things project. I may do the same thing. I can think of some small projects to tackle. Thank you for sharing at WJIM's Monday's Musings. Have a great weekend. Stopping by from Alissas coffee date ! Great post !! good organisation tips and a cute outfit !! That is a cute outfit. Comfortable and stylish. Perfect for work, church or brunch. Stopping by from womanhood with purpose. I love that fushia too. I actually have been doing the same thing this week! I love books and always thought MORE IS BETTER, but you're right... sometimes looking at books that I didn't enjoy isn't very uplifting. Out with the old and in with the new. I never thought of selling on facebook though! I really like the pattern on your skirt. And I am always a huge fan of pink. :) If you're interested, I host a weekly Fashionably Employed Link Up to share all sorts of work wear inspiration and I think this would make a great contribution, if you'd like to link up. It goes live each Monday and is up for the entire week. Thanks for sharing! Thanks for sharing your beautiful post with us here at "Tell Me a Story." You look lovely in camel and pink. Your idea of selling your already read books is excellent. This gives you spending money and a bargain for others!